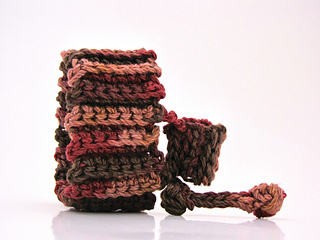 “Bam-Bam” began as a test of ribbing stitches for a simple crochet bangle. 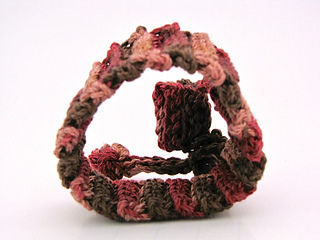 I remember reasoning that if a crochet bracelet is stretchy enough, a clasp is optional. 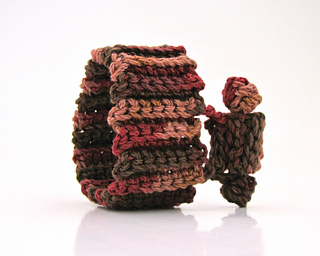 You can just slide it on and off your wrist—i.e., a crochet bangle. 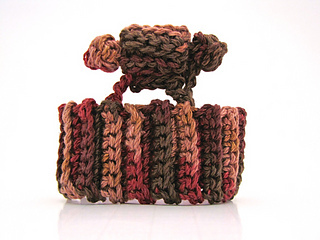 I planned to make one with back-loop single crochet rib (BLsc), and a back-loop slip stitch rib (Bss) one. I did NOT plan to add the “Bam-Bam” part. Remember Pebbles and Bamm Bamm? At the time (Sept. 2012), I was preparing to teach a crochet jewelry class at a CGOA conference in Reno NV. I don’t remember where my head was at, but after completing the BLsc band, I amused myself by free-forming the fake clasp. It made me think of Bamm Bamm Rubble, the baby boy who hit everything with a stone club in the The Flintstones cartoon. Then I photographed it as if it’s an art gallery piece, which amuses me even more! It makes me giggle too much to keep it to myself.